Its the second consecutive year of “summer time energy saving” plan in Japan, after the crippled of Fukushima nuclear plant, by the earthquake last year. We had seen lots of innovative energy savings products being released to the markets since. And for once, CoCo curry Inchibanya (a famous chain store curry house in Japan) is determined to participate in this energy savings plan, with… GUESS what!! 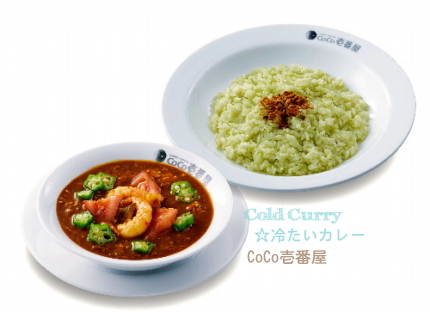 “Cold curry” is going to be on CoCo’s summer menu starting from 1st-July. But wait a minute. What has cold curry got to do with energy saving? Believe me, that’s my question too. According to CoCo’s management, the whole idea is that “cold curry” is meant to cool you down just like what ice-cream do. I doubt that the curry can cool down the heat, but their efforts is admired. After all, I could understand their desire to play a part in energy savings. I can’t imagine the taste of cold curry. Whatever its is, “cold curry” is going to be the world’s first. Even “curry representative”, India is going to be shocked by this “cold curry” launch. Anyway, “cold curry” will be available only for a limited period until end August. Have a try yourself to find out the taste, if you are lucky to be in Japan during this period.